Event #45 ($1500 Ante Up NLHE) had a field of 678 players that included some big names in poker. 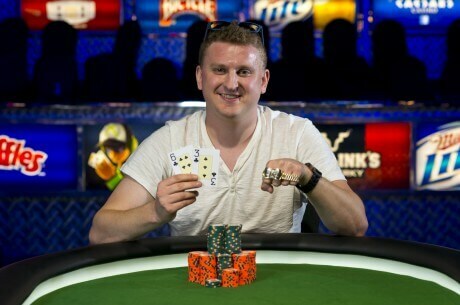 Ben Volpe ended up winning the bracelet in the tournament and the over $200,000 1st place prize. Volpe has now cashed 3X at the 2013 World Series of Poker. Only nine players came back to the felt yesterday including Chris Moorman, Blair Hinkle and Paul Lieu. Lieu is another player that has been having a great series this year, as he has now cashed four times already and has won over $250K in cash prizes. Sam Panzica was the first player eliminated from the final table yesterday. Daniel Johnson, Adam Stone and Horacio Chaves all hit the rail after Panzica. Moorman was knocked out in 5th place, but that was a good result after starting short stacked. Hinkle who started the day in 8th place in chips managed to finish in 4th place. In his last hand he moved all-in and Lieu called him with pocket queens. Hinkle had Ad/3d. The flop brought a queen and Hinkle couldn’t improve. Bonnecaze was next to go. Volpe started heads-up against Lieu with a chip lead, but both players went back and forth. It looked like Volpe would win with Q/Q against 4/4, but a 4 hit to double up Lieu. Volpe had to battle back from being down to win the bracelet.